Kitchen refaced in white with a custom island, including decorative panels on the side and back of the island. Drawer banks were added to all base cabinets. Cabinet refacing is an economical way to update your kitchen when you are happy with the current layout of your kitchen but would like to update the look of your cabinets. covering the face frames and end panels with a matching ¼ inch wood skin. We’re proud to be Tallahassee’s only Cabinet Cures dealer serving communities like Southwood, Summerbrooke and others. Our Cabinet Cures’ refacing process begins with design consultation in your home. After reviewing your project, your designer will help you explore available options. Once you’ve selected a wood type, door face style, and finish, we will give you an estimate on the cost of the project while we are there in your home. Once you approve the estimate and design we will schedule your project, we guarantee our start and finish dates. Refacing begins with our installers removing your old doors, drawer fronts and hinges. We will then install all new doors, hinges, drawer fronts and reface your cabinets exactly to your specifications. All of the new doors and drawer faces are custom-finished by hand by highly trained craftsman. We avoid using laminate veneers. When complete you have a truly custom kitchen that looks and functions great! All doors, drawer fronts, moldings and panels are custom finished to your specifications. Your existing cabinets are left in place saving all that material from going to the landfill. 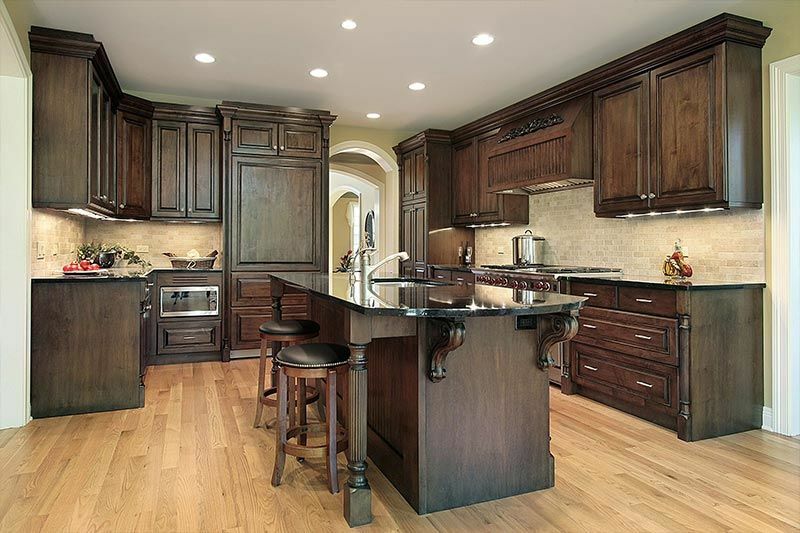 This process is completed your existing cabinetry and counter tops in-place. This means very quick turnaround times, less mess in the living spaces, and less disruption of your day to day routine when compared to traditional cabinet replacement. If you’ve installed stone or other high value counter tops we can reface your cabinets without having to remove or replace them. Cabinets refaced in a dark walnut with added decorative elements like crown molding, light rails, corbels, turned legs and decorative panels. We are very proud to be a Cabinet Cures Dealer. 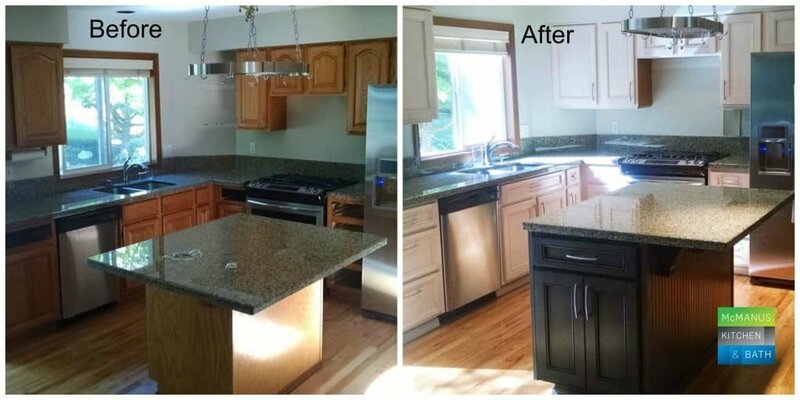 The Cabinet Cures refacing system was developed by Kelly Koch in Portland, OR. Kelly started as an antique furniture re-finisher and became one of the most sought after re-finishers in the North West. 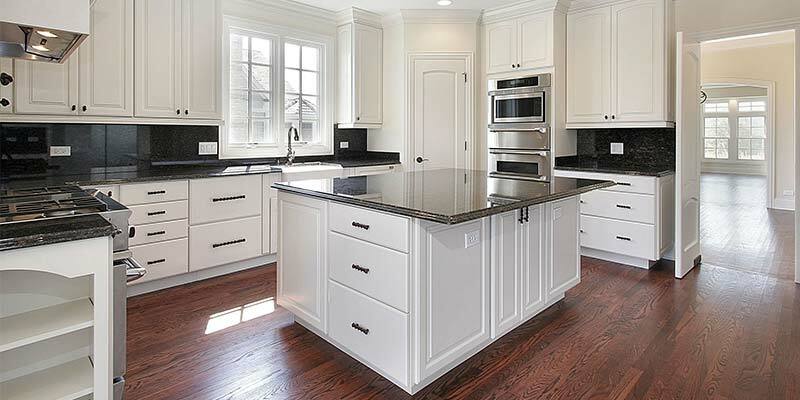 Cabinet Cures was originally a re-finishing business until Kelly developed his refacing system that allowed him to provide the same quality finishes more quickly and at a lower cost to the homeowner. Over the last few years Kelly has expanded his production facility so he can provide his system to dealers like us. The Cabinet Cures system is a truly custom system for remodeling your kitchen cabinets. Doors are made in the USA by Brentwood Manufacturing. Unlimited Door Styles. With Brentwood manufacturing we can provide you any door style you can imagine from simple shaker doors to custom curved door panels. Doors can be made from many species of wood. We currently offer oak, maple, alder, cherry, hickory, walnut, and sapele, as well as rustic cherry, alder, and hickory. Dozens of finish options, including hand rubbed glazes. Doors are custom finished in Portland Oregon by experienced craftsman using lacquers and stains developed specifically for our refacing system. If you have any questions about cabinet refacing or would like to schedule and design consult you can contact us at (850)564-8756 , email paul@mcmanuskb.com or by using the contact form on our website. This entry was posted in Bathroom Remodeling, Home Page, Kitchen Remodeling Tallahassee. Bookmark the permalink.